In this article we are going to see how to zip, save, download a file in codeigniter PHP framework. codeigniter is a very popular PHP framework. Previous article is about how to upload a file using codeigniter PHP framework. 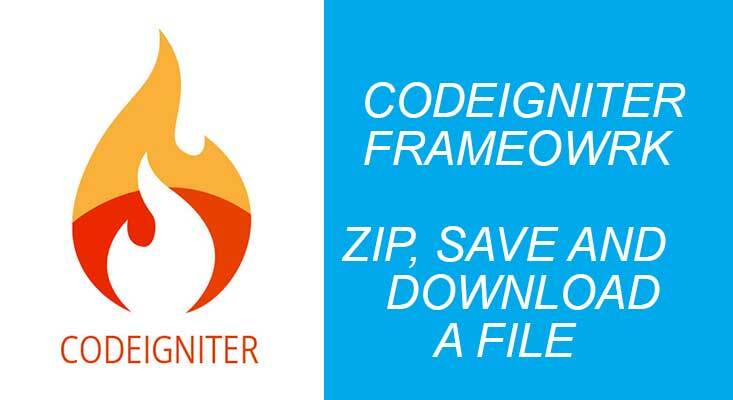 Codeigniter framework you can do many tasks very easily. Compressing and downloading or saving can be done very easily. After loading the library we can use the zip object. The code snippet below shows how to create a zip file, save it and download it. //Write the zip file to a folder on server with name. "example_backup.zip"
//Download the file to system. Name it "my_backup.zip"
2. Add a folder named “zippedfiles” in root folder. //Create zip file on server with name. "example_backup.zip"
//Download the file to your system. It will be named "example_backup.zip"
In code above We have created a class named Zip that extends CI_Controller. Inside constructor, that runs each time when a class object is created. After calling parent constructor, we load zip library. Inside index action we create a variable name $filename and a $filedata with content. Zip object’s add_data method is called with $filename and $filedata params. The code above, archive method of zip object saves file to a specified path. Finally the download method of zip class object downloads file to user’s computer. The code above can be used in any of your project to zip and download zip archives. Please leave your valuable feedback and comments below.